This month’s Everyman Eats column brings you popular culinary affordable oddities from Tokyo and its surrounding prefectures — served with a dash of local culture. 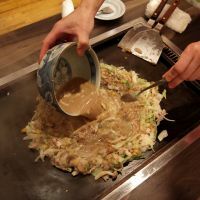 Any food-inspired map of Kanto will have a big fat star over Tokyo’s Tsukishima district, an enclave of eateries devoted to a single dish: monja-yaki. The 70-odd restaurants along the main Monja Street drag each have their own take on the recipe, which has a base of flour, water and flavorings that might include katsu sauce or dashi broth. From there, it’s pretty much anything goes — dried shrimp, squid, pork and vegetables are added to the mix and cooked by diners into a slurry on a tabletop griddle. 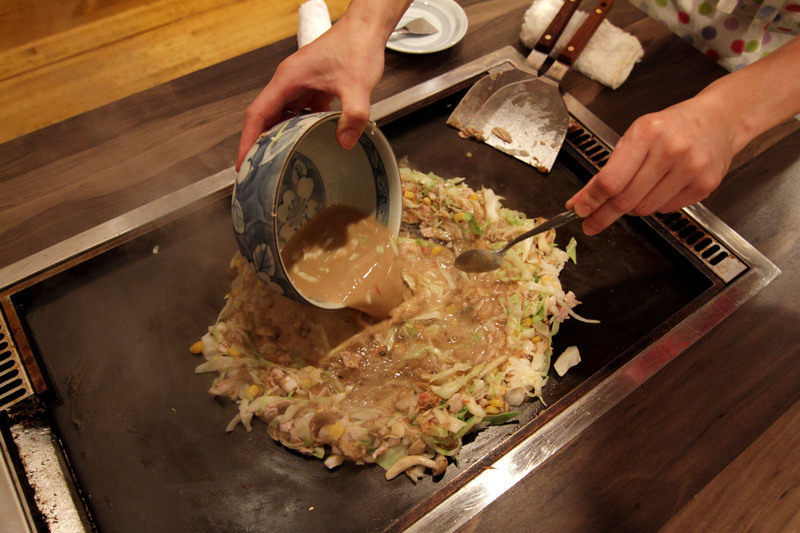 The everything-and-the-kitchen-sink version at Monja Mugi (1-23-10 Tsukishima, Chuo-ku, Tokyo;  3534-7795) is particularly noteworthy (¥1,450). The culinary heritage of Kanagawa often reflects the prefecture’s maritime roots, and Yokosuka kaigun curry is no exception. Originating from the contacts between Japanese and British navies during the Meiji Period, the dish is made from a simple roux, meat (beef or chicken), carrots, onions and potatoes. It’s evolved into a type of Kanagawa soul food and, as at Yokosuka Kaigun Curry Honpo (1-11-8 Wakamatsu-cho, Yokosuka, Kanagawa Pref. ; www.yokosuka-curry.com), is universally served with white rice, salad, chutney and milk (¥1,200). For sheer versatility, it’s hard to beat the local Saitama specialty known as Gyoda furai. Some restaurants serve this old-style fast-food dish as a flat, round pancake, while others fold it like a crepe or hand-mold it into a torpedolike croquette. The traditional version is made from a savory wheat batter mixed with pork and leeks, which is pressed thin while cooked on a griddle. At Tajima (2-18-11 Fujimi-cho, Gyoda-shi, Saitama Pref.,  555-1734), the whisper-thin Gyoda furai can be ordered with either soy or katsu sauce (¥450). Coastal Chiba Prefecture and the landlocked Chinese province of Sichuan might not have a lot in common, but fishermen and ama shellfish divers in southern Kanto rely on fiery dandan noodles to warm their bodies in winter. Their local take on the dish, Katsura tantanmen, retains the original recipe’s spicy chili oil — and lots of it — but adds soy sauce to the soup base. The well-loved version at Ezawa (150 Naraihara, Kamogawa-shi, Chiba Pref.,  97-1559) cuts the heat with a topping of raw sweet onions (¥800). It must be tough for parents in Omachi City to keep a straight face when telling their kids not to play with their food. This area of northwest Nagano Prefecture is renowned for a dish that looks like a diorama. Kurobe Damu karē was, in fact, inspired by a massive postwar public-works project. The dish consists of an arched “dam” of white rice that butts up against a “lake” of Japanese-style curry, in which floats a “pleasure boat” of hamburger or fried meat. The ambitious version at Buta no Sanpo (3168-8 Omachi, Omachi-shi, Nagano Pref., www.buta3.jp) pairs 400 cc of curry with a 25-cm-tall mound of rice that’s topped by a slab of braised pork (¥1,680). Like the great wine- and cheese-producing regions of France, Itoigawa in southwest Niigata Prefecture maintains strict control over its signature culinary product. The deep hue of Itoigawa black yaki-soba comes from the ink of squid caught in the Sea of Japan, and the noodles are made only with Niigata-grown wheat or rice. At Tsukitoku Hanten (2-5-18 Omachi, Itoigawa, Niigata Pref. ; www.tsukitoku-hanten.com), the soba is crowned with a thin omelet (¥800). Unlike their cousins in Niigata, cooks in the western Ibaraki town of Koga take a laid-back attitude to their local specialty. The curry-flavored noodle bowl shichi fuku karē-men takes its name from the seven gods of happiness — a nod to the popular local shrines to the deities. The only rule for the dish is that seven distinct ingredients be used (in addition to curry powder and noodles); at Sakaiya (1-11-29 Higashi, Koga, Ibaraki Pref., www.soba-sakaiya.com), that means a colorful mix of udon noodles with fried chicken, shrimp, eggplant, lotus root, red bell pepper, broccoli and pumpkin (¥950). How rare were Italian restaurants in Gunma Prefecture in 1970? So rare that when an eatery called Shango opened in the central city of Takasaki that year, it caused a sensation that continues to this day. The tastiness and large portions of the dishes has led to an annual prefecture-wide competition called King of Pasta, whose winner is determined by popular vote. Meanwhile, the original Shango (1-10-24 Tonya-machi, Takasaki-shi, Gunma Pref., www.shango.co.jp) has spawned a mini-empire that now includes nine locations. Featuring aodake (blue bamboo) noodles in a light soy broth, Sanno ramen has been enjoyed in Tochigi Prefecture since the Taisho Period. But it was in the bubble era — when salarymen from Tokyo went on golfing trips in northern Kanto — that the dish reached a wider audience. Yamanashi Prefecture‘s hoto udon has been officially recognized by the ministry of agriculture. Thick wheat noodles are cooked in a broth of miso and niboshi dried fish; the long simmering time allows them to absorb maximum flavor. Residents of Hamamatsu in Shizuoka Prefecture believe that their town — and not Utsonomiya in Tochigi Prefecture — deserves the title of “Gyoza City.” Hamamatsu dumplings are easily recognizable: They’re topped with bean sprouts and served in a circular pattern straight from the frying pan.